Rattlesnakes of Arizona (2-volumes) is a multi-authored, peer-reviewed book (1256 pp.) that is intended for both professionals and laypersons. Each volume stands on its own in content yet they are complementary. This book was inspired by scientific and creative approaches to form, function, and context. Our main goal was to create a collaborative fusion of art, natural history, and science that enlightens and inspires. Early ancestors of humans understood the linkages between observation, understanding, and depiction. Their spectacular murals on cave walls in France, and their petroglyphs and art throughout the United States and Mexico, are a testament to the significance of these connections. As we labored toward a mature capacity for reason and science, these connections were forgotten for a time; but we have come around to better understand our own brains and behavior, and ironically we find it easier to understand those ancient activities in the 21st century. This stunning and large volume (736 pages) on Arizona's rattlesnakes in landscape format has 17 chapters by 22 leading authorities covering in-depth aspects of natural history, behavior, evolution, and conservation. A special chapter is on art and rattlesnakes. Original art is by the acclaimed and award-winning wildlife artist Tell Hicks, who was commissioned by the Chiricahua Desert Museum and Eco Publishing for this project. Hicks' breathtaking art of rattlesnakes and other animals graces the pages throughout the book. This volume is especially intended for anyone interested in rattlesnakes and their role in the southwestern deserts and other ecosystems. There are hundreds of beautiful color photos (many are full-page in size) of rattlesnakes in situ, as well as attractive figures (graphs) and tables. His paintings of snakes in their habitats are extraordinary. 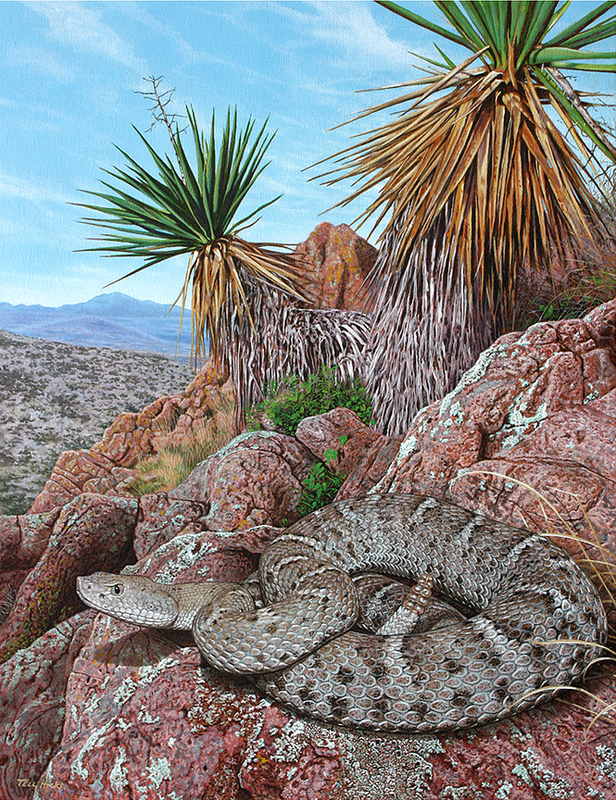 I especially love his New Mexico Ridgenose Rattlesnake, which is one of the most beautiful animal paintings I have seen. The second volume of Rattlesnakes of Arizona is a collection of 13 highly focused, synthetic chapters by leading experts, which cover a wide range of topics, from phylogenetics and genomics to reproduction and social behavior. Emphasis is on species of Arizona and nearby areas. Conservation is highlighted in two chapters. Several chapters are dedicated solely to the development and evolution of the rattle itself. No academic book on rattlesnakes would be complete without a chapter on venom, and the one in this volume will not disappoint. Like its companion, it is replete with beautiful photographs of rattlesnakes, as well as many figures and tables. It issurely to become the new, up-to-date authoritative reference on these iconic animals. We anticipate Volume 2 to be published in late fall 2016.